Baldy's bike is a pice of art! and has got every thing you can ask for! Wow, thanks guys. The bike performs way better than I could have hoped for. The power is amazing, it has a huge amounts of torque from idle to redline and it wants to try and rip my arms off. It gets to a 100 so fast and easy without any effort and handles better than the stock GPZ750 due to the light weight, modern swingarm and shocks. There is so much power and it comes on so smooth it is really addicting. It surprises modern bikes on a regular basis, I gave a 2010 ZX14 a run for it's money last weekend. The rider didn't take me serious until he realized I was getting away from him then he decided to get serious on the straights and catch up then I would pull away from him in the twisties. Very fun 20 mile ride on a fun twisty road. Congrats on another BoM Baldy! Nicely done! I do not know what it took to plug the 1100 motor into the 750 frame, but it could not have been easy. Nicely done Baldy, it gives me pipe dreams of another project. Guess I should get mine finished first. Awesome! Nice work and congrats on BOTM!! 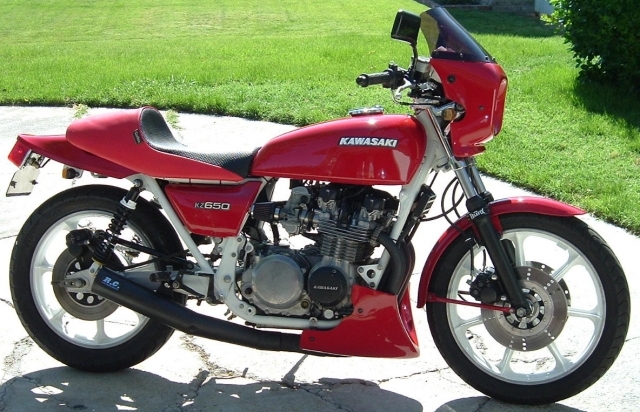 Just got back from holidays, this bike is something I wanted to make myself, I have a brand new engine (with second hand head) sitting out the back (GPZ1100 B2) ready for me the put into a frame like this one, although I might have a hard time getting the ZRX bits. I love it. Now you got me looking for a frame from a GPZ 750/1100 Has anyone in Australia got a straight frame for a reasonable price??? Congrats Baldy, I have long thought this bike was one of the coolest modded bikes on here. Sweet bike baldy. Love the 650 too! Baldy, what is the deal with the blue R on the side panel emblems? Uk Euro were all red R.
Love it lotta work and detail ....put on GPZ750 decals and you'd get sleeper of the year award too ...... and I've always thought since I first joined your 650 was amazing ...... usually don't like a painted frame other than black and red is maybe my third or fourth fav color but this just comes together and is perfect. Tyrell Corp wrote: Baldy, what is the deal with the blue R on the side panel emblems? Uk Euro were all red R.
Thanks again for all the compliments. The 1982 U.S. ELR got the blue"R" and the 1983 version got the red "R". The badges I put on I ordered from a Kawasaki dealer in the late 90's. They are OEM. Color in the forest is starting to look great . I Love the fall for back road cruises to the Apple Cider mills. I have a suggestion for BOTM that might be worth considering; If the bike has a project thread here could you post a link to it?